The so-called Monsanto Protection Act signed into law earlier this year caused such an outrage that people around the world are planning to protest the biotech company later this month. Now a United States Senator is expected to try and repeal that law after mounting pressure. The notorious ‘Monsanto Protection Act’ rider stuffed into the non-related Senate spending bill may soon be repealed thanks to the massive amounts of activism and outrage that have now amounted into a legislative charge towards action. 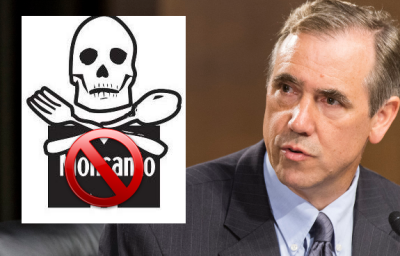 Action that has turned into legislation progress through Senator Jeff Merkley of Oregon, who has announced an amendment that would remove Section 735 (the Monsanto Protection Act as its known) from the Consolidated and Further Continuing Appropriations Act of 2013 Senate spending bill. The rider, which almost managed to slip incognito and pass by the alarm system of the alternative media, grants GMO juggernaut Monsanto full immunity from federal courts in the event that one of its genetically modified creations is found to be causing damage to health or the environment. Essentially, it grants Monsanto power over the United States federal government. Thankfully, I was able to get on the subject through news tips and covered the Monsanto Protection Act all the way up until the bill containing it was signed into law by Obama. Ultimately, as the Monsanto Protection Act became more a hot issue, we had an increasing amount of publicity — but the Senate vote came just too quickly for the attention to put a halt on the rider. But even after its passing, sources like Russia Today, NaturalNews, Infowars, and myself here at NaturalSociety were sounding the alarm big time. Enough so that it even led to an apology from the top Senator who actually ended up approving the bill containing the rider. Senator Barbara Mikulski of Maryland actually went and released a statement apologizing for allowing the Monsanto Protection Act through and vowing to fight against GMOs and Monsanto. Ultimately, multiple Senators had entered damage control after the jig was up. That is besides Senator Roy Blunt from Missouri, who actually worked with Monsanto (as in he let them write it while he received funding) on the Monsanto Protection Act rider. A rider he says is perfectly reasonable. After all, why not give Monsanto full immunity from the legal system the rest of us are subject to? Even Obama was getting blasted on his Facebook page following the approval of the Monsanto Protection Act, with the majority of comments coming into his page criticizing his signature on the bill that contained the rider. Thanks to this activism, it looks like the Monsanto Protection Act may soon be repealed after this new bill hits Washington. This time, we will have plenty of time to let the Senators know that they are voting against the public if they choose to side with Monsanto. And with such a specific agenda for this bill, I see it doing well in the Senate. O know the US is doing something??!!! Boy I wonder if when they got wind of 53 country's and over 2.000.000 peoples of all races will be marching in there city streets in to make a point to OUT RIGHT END THIS COMPANY's GMO foods worldwide. The stuff they are spraying on GMO crops is killing BEES and birds worldwide that is insanity at it's best. Media and world governments can not Hide this march as thousands of people own cell phone cameras that they will be down loading photos on Face book U-Tub and other sights worldwide…..WOWEEEEEEEEEEEEE People are indeed a WAKING UP BIG TIME……POWER TO THE PEOPLE…. City GMO Restriction: In the City of Boulder, it is illegal to plant GMOs on public land. The City is the largest land owner in the city, with approximately 40, 000 acres under its control. San Juan County: Washington was able to pass what is known as Initiative Measure No. 2012-4, which actually bans the growth of genetically modified organisms within the county. City GMO Ban: City of Arcata City ordinance states that “it is unlawful for any person, partnership, corporation, firm or organization of any kind to sell, distribute, propagate, cultivate, raise or grow seeds or crops of genetically engineered organisms in the City of Arcata…” Ordinance No. 1350 (2004) http://www.environmentalcommons.org/arcata-ordina…. City GMO Ban: Point Arena passed Ordinance No. 193 which states that “it is unlawful for any person, partnership, corporation, firm or organization of any kind to sell, distribute, propagate, cultivate, raise or grow seeds, whole plants, or crops of genetically modified organisms in the City of Point Arena” Chpt 8.25 of City Code (2004) http://www.environmentalcommons.org/Point-Arena-O…. Is there an online petition to sign, one that goes to our representatives (respectfully )? It would make it ot easier for all of us to join in! Please can you make that happen?? Thank u, & let us never give up the fight against monsanto!!! Until companies selling us poison in our food such as Monsanto are eliminated from doing business, no one on the globe is safe. They have been banned in most European and industrialized nations and it frightens me that our citizenry hasn't been in more of an uproar. Their business practices are criminal. Their company leaders should be bankrupted and the land returned to the farmers they stole from. World according to Monsanto is a documentary which thoroughly disgusted me and still does. Jerry, I believe most of Congress calls then "MoneySanta"
We must stop using the word "Monsanto",and start publishing the names of those that work for Monsanto.We must make it allot more personal because one of them may be your father,or,mother,or,neighbor,or,may not be American at all. Thank You Anthony – for your tireless Efforts! You ROCK!!!! Power to the internet… hah!! This wouldn't have been possible without the web. I appreciate your work covering this extremely important story. We all have to get more involved in the activism against gmos and the likes of Monsanto. I posted my encouragement and appreciation on Senator Jeff Merkley's Facebook page. It takes some courage to do the right thing. I want him to know i am paying attention. I encourage all of you and your friends to find out how your representatives stand on this issue and post on their Facebook pages. They have staff who read those posts and so do many of their followers so you don't just reach the senator or congressperson, you reach their followers. Done! Thanks for mentioning that! Yes they do realize this…….that’s the problem!!!!!!!! Let's all band together to FORCE our Crooked and Dishonest Government to repeal "The Monsanto Protection" Act. When is anyone in this country ever protected from doing anything CRIMINAL? This country is trying to Eradicate Terrorism in this Country and Around the World. Do the Politicians of the U.S.A NOT REALIZE that Monsanto is a Terrorist. They are KILLING Humans and DESTROYING the Environment around the World by KILLING us with the Genetically Modifying our Foods, DISRUPTING our Eco Ssystem and Poisoning Everything that ALL living Being are Eating, Drinking and Breathing. Governments are Esentially PROTECTING Terrorists! "When is anyone in this country ever protected from doing something CRIMINAL?". Every time an Obama policy gets supported by the media and the fools who voted for him, THAT'S WHEN! Immigration amnesty is supporting criminal behavior. Fast & Furious was criminal. Benghazi was criminal. The way Obamacare was railroaded through was criminal. The use of IRS agents to harass political enemies was criminal. The support of ACORN was criminal. The failure to require the Senate to pass a budgetfor the last four years is ccriminal. In fact, if they had been working on an actual budget instead of this emergency stop-gap bill, the Monsanto part probably wouldn't have made it through. I have a proposal. Drop the Monsanto clause in exchange for dropping Obamacare and creating an actual budget. But you are doing the same thing they are friend. You are proposing to slip this through because they slipped that through. Obama care is supported by the overwhelming majority of Americans, I'm sorry, you live in a basically democratic country. Do you think Majority should have the say or not? (in obama cares ideal form, which is not and probably never eill be, providing essential medical care to citizens of a very wealthy nation – unless you are a Multi millionaire, you too stand a chance of loosing all you own if you get cancer etc. look, we should never have allowed medical care to get this costly and we should have never have allowed insurance companies to cover so little at such a high premium, deductible etc. – how do you propose we get it right kind sir? this bill is an abomination to nature…who wrote and submitted this bill anyway…that person should be deposed.. THIS MY OPINION; why would Congress ever grant such an Act to benefit a corporation. especially a corporation like Monsanto.. who only purpose to help fulfill the one World government and the extermination of 80 % of the world population… Now you might where did I got that.. check it out for yourself, its all there for you to read they don't care that s how bold these cabal are. its time to get Monsanto out of our country, sue them into non existences.